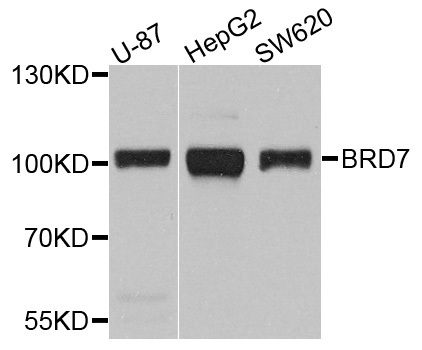 Western blot - BRD7 Polyclonal Antibody. This gene encodes a protein which is a member of the bromodomain-containing protein family. The product of this gene has been identified as a component of one form of the SWI/SNF chromatin remodeling complex, and as a protein which interacts with p53 and is required for p53-dependent oncogene-induced senescence which prevents tumor growth. Pseudogenes have been described on chromosomes 2, 3, 6, 13 and 14. Alternative splicing results in multiple transcript variants. BRD7 Polyclonal Antibody. Unconjugated. Raised in: Rabbit.